Conventional metering pumps rely on vacuum sensing or mechanical activation to compensate for leakage past the plunger and may not compensate on every pump stroke.Hydra-Cell pumps incorporate a replenishment valve in every piston assembly which operates on the suction stroke, thus ensuring optimum actuating oil volume on every diaphragm pressure stroke to provide superior accuracy. WANNER says its new Hydra-Cell Metering Solutions model MT8 triplex metering pump is designed to handle a variety of processing liquids with very high accuracy at very low flow rates; delivering a smooth virtually pulse-less flow for a very homogeneous injection of liquids at process pressures from 0 to 245 bar. 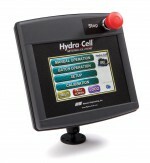 Hydra-Cell pumps are claimed to offer the most economical solution for precision metering and dosing thanks to their simple, clever design with multiple hydraulically balanced diaphragms in a single pump head.